This item has been introduced in E-Prime 2.0 SP1. The Celeritas System is a fiber optic response collection system that accurately gathers participant responses from the Celeritas Button Response Unit (BRU), the Celeritas Joystick, and/or a standard desktop joystick. For information about Celeritas's capabilities, see Celeritas Fiber Optic Response System. Celeritas does not appear as an available device within E-Studio until the Celeritas System software has been installed. 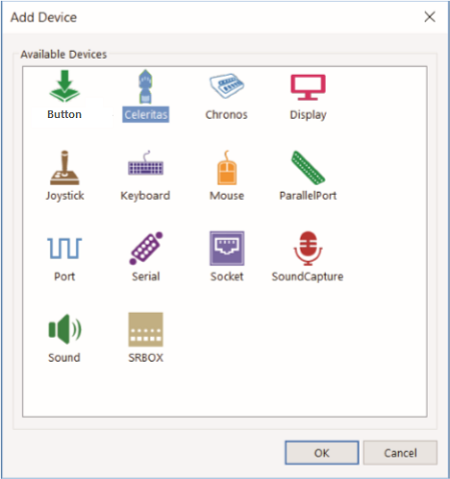 Once the Celeritas System software has been installed, Celeritas appears as an available device in the "Add Devices" dialog. To access the Celeritas device, double-click the Experiment Object at the top of the Structure window, navigate to the Devices tab, and click the "Add" button.